So I recently won the drawing for the Pontoonstuff.com all out rebuild giveaway. Being that I have never won anything even close to something like this I am beside myself. Today I talked with James the President on Pontoon Stuff and forum member here and now I am even more excited. My plan is to document everything as best as I can. Explain my situation etc. Tell my story and the story of this amazing opportunity I have been given. I plan on using pictures and hopefully some videos as I go through a major rebuild on my boat. So first off about me and my boat. I'm the father of 5. Ranging from almost 21 to twin 10 year olds. I have 4 girls and one boy (right in the middle) These kids are the reason I bought the pontoon. Obviously, having 5 kids costs a bit. So a new boat was out of the question. Plus I am kind of a tinkerer. I like figuring out stuff and making it my own. I'm no expert though. But I generally research (like on this forum) and figure stuff out. As for the boat. We went on a trip to KY Lake a few months ago. We used to go there a lot with my grandfather when I was a kid. He passed away last year and it had been years ago since we had been there. But he instilled in me a love of fishing and just being on the water and in the outdoors. So at just shy of a year we found ourselves going back to a place he loved. Dad and I plotted it all out but it was a quick trip. We had 4 days including travel time. It takes 6-7 hours to drive so basically like two days there. So we rented a cabin and left my camper at home. Drove down and had a blast. 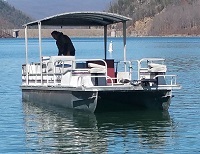 For one day we rented a pontoon boat. ... You know what is next. I was sold. I now wanted one bad. I started searching craigslist etc. Several weeks later I happened on one in the FB marketplace and messaged the guy. Most in my price range were trashed. Total rebuilds or at least the seats. But this one looked usable. Sure it was old but I knew I could get a couple years out of it. The catch. The motor lower end was bad and off the motor. So I took of work and the wife and I went to look and bought it. I found a lower end and put it together and I had a running boat. I did tinker with it for a while. Then took it to KY Lake again. It worked great. We loved it. I will go over some of my mods I did pre trip later. Fast forward to yesterday. I got chosen to do this rebuild. I have been planning a rebuild since the day I bought it. Playing with Pontoon stuffs deck builder etc. Figuring a couple years from now I would do a rebuild. But that has been fast forwarded a bit. So I figured I would start this thread and whenever we decide to start the rebuild I will update it as I go. I'm hoping for tons of pictures and videos. Gonna make my kids help me out on that front. So here are some pictures of the boat when I found it online and the day I picked it up. one more at home at my work. Checking things out for the first time. I had to put a gear box on the motor but then it fired up and we have since taken it down to KY lake on Vacation. We had a blast. Wow that's a good looking toon already! GOOD LUCK! Any ? 's just ask! It has its issues. But it for sure was in better shape than I expected to find. The floor obviously has issues in the front, and the seats have a few rips and wear spots. Usable for sure as is. And as much as I want to do the rebuild today I hope James is ok with me waiting a while so I don't totally miss out on boating season. Not sure if you can see but my trailer needs some TLC too. It is a royal pain to load. The guides are missing. The bunks are in need of replacement. It will probably be my first step in my rebuild actually. Going to paint up the few spots on the trailer that are rusting too. I wish it was a tandem axle trailer. But we towed it to KY lake and back and it seemed to do just fine. Bearings stayed cool and it towed well. So I guess it will do. Just got to get those bunks and guides right. Just figured I would share. Sounds like we're in for a great rebuild story, with a great family attached! [quote="PlaynDoc"]Sounds like we're in for a great rebuild story, with a great family attached! I hope so. I am for sure looking forward to it. I think that is a great gesture for him to put that out there for us and I want to do my part to give him the exposure. Going to get a LED trailer light kit to install while I am at it. I think they are reasonable around here (like $40 maybe) I'll have to see for sure, but it seems to be what I have seen them for in the past. Plus some other cool goodies I will be able to try out on my current setup. The thought is, if I figure out I need to do it different by trying it now, then I haven't messed up my new floor or seats etc. Well I got a delivery a few minutes ago. One of two that will be my bow seats. I didn't really like the look of this seat until I saw it in person and sat in it. It is bigger than I thought at first. I was thinking the little cheap bass boat seat size. This is a comfortable, great looking chair in person. Very nice. So I am still deciding on the exact layout I want. I am thinking center console since we fish most times we are on the water. That gives us room to move around. I'm going to use these seats as a bit of a test for what I have in mind. I'll be installing them on the boat as it is now and using them until the fall when I decide to tear it all down. I also got an extra base so I can move them inside the rail as I need to. My guess is that that won't happen a lot but you never know. Choppy water or just feel like having more comfy seating inside that isn't like a couch. I'm really thinking about trying to find one of the tent enclosures. While a full enclosure would be amazing I doubt I could swing that one anytime soon. Plus it would be my guess only my son and my self would be using it much. I like this chair the more I handle it. I'm telling you though the visit up there was so worth it. I got so many ideas and answered a ton of info. Just thinking out loud. Would be a cool event if you could get a location and some other people that have rebuilt with PS stuff. Just thinking out loud on that though. I've got to get a photo album going though for sure. Can't wait to try out some stuff. Any pics on the water since your waiting until fall to gut and rebuild the ole girl? You know I don't have one of the boat on the water. I have a couple from our first trip out when my wife took over the helm. But not much. Guess I get to busy enjoying it. I'll see if I can dig those up though. I'll have to remember to take a few pictures next time I get it out too.